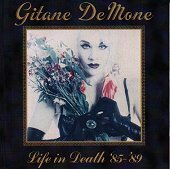 Dedicated to the life of Christian Death founder Rozz Williams, former Christian Death member Gitane DeMone offers up a collection of tracks that she sang lead vocals on; a collection of songs that are a "testament to those years ['85-'89] behind me. I'm glad I sang those songs." The disc opens with "Lament," a gothic carnival ride recorded in 1985; a duet between Rozz and Gitane, it helps set the mood for the "Life in Death" title of the disc and the entire tone for the CD. The rest of the album is what you'd expect from Gitane DeMone leading 'Christian Death.' It's very melancholy; dark and filled with angst, lust, sorrow, and hardship, the music vibrantly speaks for itself as Gitane's vocals lead the way. And though she didn't write a lot of the lyrics, her voice sings with such a passion, such experience, you can't help but feel as if she is living the words she sings. Powerful, intimate, and melancholy, this album is a gothic treasure. Gitane salutes the late Rozz Williams, pays tribute to his life, and gives her fans a collection of songs they won't soon forget (even if they've probably heard them on the various full-lengths and singles they came from). Here is Gitane in all her Christian Death glory on one disc, which fans will surely flock to. I'll give it a B-.